Get ready for another 24 Hours of LeMons weekend, folks, because the Detroit(ish) race is coming up this Saturday! The Toledo race may be the most punishing of all the LeMons events, because it's the only one that literally runs for 24 straight hours. Last year's Detroit People's Choice winners- who work as designers for The General when they're not building cheap race cars- have upped the ante this time around, by building a truly astounding deuce-and-a-half out of a '91 GMC Sonoma. Yes, you really are looking at dual rear axles on a $500 truck… and there's more lunacy we aren't even seeing yet! Make the jump to see all the photos and read the team statement. I'm on Team "First Blood" #4. Last year we took Peoples Choice with our Back to the Future DeLorean and to make sure nobody outdoes us this year, we are totally outdoing ourselves! We've compromised the great performance of last year's 84 Supra for something we thought might be a distantly decent performing car....er.....truck. 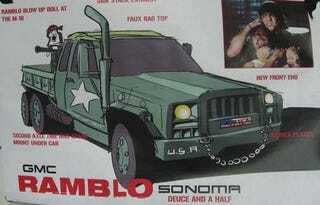 We'll be showing up with a 5sp 4.3L '91 GMC Sonoma that's been transformed into Rambo's chariot of carnage. I don't want to give up too much too early, we will eventually be doing killer video but I can show some teaser pics. There are still the graphics and props to be added so it will only get more insane. This is what you get when 10 art school grads get nutty. I like to say I'm the only one who wants to build a race car, the other 9 just want to build a parade float! Most of us work as designers for GM so this is our outlet to buck all the criteria, human factors, and common sense in leu of emotional impact.